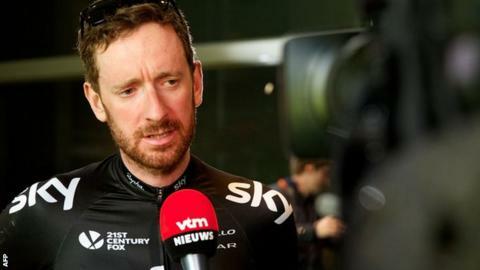 Britain's Sir Bradley Wiggins believes he can stay with the favourites into the gruelling final stages of the 257km Paris-Roubaix one-day race on Sunday. Three-time winner Fabian Cancellara has previously doubted the 33-year-old Team Sky rider's ability to compete in a race dubbed the Hell of the North. But 2012 Tour de France champion Wiggins said: "I think where I will come to the fore is in the final 50km." Wiggins used the Tour of Flanders, in which he finished 32nd, as preparation. "I wouldn't have risked it in Flanders if I didn't want to do well in Roubaix," he said. "Whether it happens or not is another thing. "I'll have the legs and the length. Obviously there's a lot that happens before then, and it's avoiding all of that stuff." Wiggins knows few will look for the potential winner beyond Trek rider Cancellara, Omega Pharma-Quick-Step's Tom Boonen and Sep Vanmarcke of Belkin. Swiss rider Cancellara is hoping to complete an unprecedented third Flanders-Roubaix double, while Belgian Boonen will be attempting to win the Roubaix for a record fifth time in 10 years. "It would be nice to be in their company," added Wiggins. "I think that's going to be my biggest challenge. That alone would be quite something." Wiggins last raced Paris-Roubaix, known as the Queen of the Classics, in 2011 but was also planning for a serious assault on the Tour de France that season. The Tour is not a priority this year, allowing Wiggins the freedom to take a more combative approach to the race, with 51.1km of cobblestone sections littering the route to the iconic finish in the Roubaix velodrome. "I have no bigger picture and I can afford to take the risks in these races now," he added. Britain's Geraint Thomas is also expected to be among Team Sky's potential race leaders, while Luke Rowe is also racing. Fellow British riders Andrew Fenn (Omega Pharma - Quick-Step), Stephen Cummings (BMC Racing), David Millar (Garmin-Sharp), Alex Dowsett (Movistar), Jonathan McEvoy, Erick Rowsell and Scott Thwaites (all Team NetApp Endura) are also competing in the race. Listen to live commentary of the Paris-Roubaix on BBC Radio 5 live sports extra from 13:00 BST on Sunday.